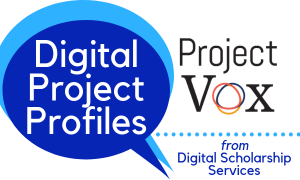 The Digital Project Profiles series features projects that have partnered or worked closely with Duke Libraries’ Digital Scholarship Services (DSS) department. These projects illustrate the kinds of research, pedagogical, and publishing questions that DSS addresses. For assistance with your own project, contact askdigital@duke.edu. An open educational resource, created and run primarily by students and volunteers, that provides resources for incorporating early modern women philosophers into research and instruction. In late spring 2014, a project team formed at Duke University to build a website that could support research and teaching about non-canonical women philosophers, and they launched the Project Vox website in March 2015. From the start, the team has included undergraduates, graduate students, faculty, librarians, and technical staff. The Project Vox website serves as the virtual hub for an international network of scholars to work together in expanding research and teaching beyond the traditional philosophical “canon” and beyond traditional narratives of modern philosophy’s history. Philosophy is a surprisingly static and homogenous discipline. For the past fifty years, the humanities have been dominated by women; yet in philosophy, women make up only one-third of advanced degree recipients. In terms of gender diversity, it aligns more closely with (and in some cases falls below) the historically male-dominated sciences. What could be the reason for this gender gap? Recent studies suggest that undergraduate philosophy courses set the stage for this divide, particularly when the majority of figures studied are male. While the latter half of the 20th century saw many humanities disciplines expand and reform their canons to include marginalized voices, the discipline of philosophy saw little change. The figures and texts that dominated philosophy in the early 20th century persisted into the 21st, despite research demonstrating that a number of early modern women actively engaged with and influenced philosophical discussions with their more famous peers. Ultimately, Project Vox seeks to change the field and the face of philosophy by providing information and materials necessary to incorporate women philosophers into undergraduate instruction. 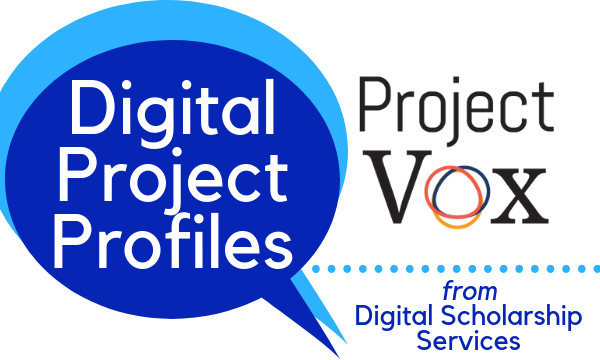 What makes Project Vox an important case study for digital scholarship? In addition to its intellectual aims, Project Vox is an important case study because of its successful open-access publication model and the workflows that support it. Project Vox is an open-access publishing project, run by a predominantly student team, that provides participants with hands-on experience and education in digital publishing while also presenting users worldwide with resources for changing their philosophy research and instruction. As a project with long-term and lofty objectives, Project Vox pursues incremental impact toward its goals while minimizing the costs for sustaining that effort. To do that, the project has placed particular emphasis on outreach and assessment, systematically engaging with the project’s audiences to solicit feedback and encourage participation in the project. To increase the pace of publication and distribute work, the team has developed a collaborative approach to research; Project Vox is now in the process of codifying this workflow for sharing with international partners. What has working on Project Vox taught us? To keep up with Project Vox on social media, please follow them on Facebook and Twitter. For questions about this and other digital scholarship projects or to get advice for your own, contact askdigital@duke.edu.